Started in 1988, originally as Active Enterprises, AE Shopfitters is a small family owned cabinet making business, servicing commercial refrigeration and stainless manufacturers. With over 30 years combined experience, David and Allan are a father/son team who will provide you with a competitive quote and superior skills. 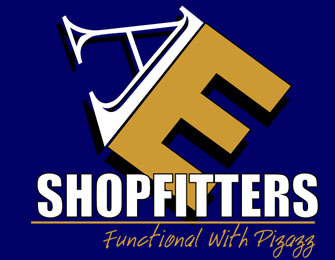 AE Shopfitters also employs office staff and apprentices and continues to grow each year. 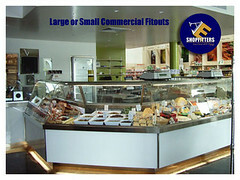 AE Shopfitters have remained small enough to ensure quality controls but are experienced in all aspects of food outlet and catering shop fitting. We are able to supply everything from a small vanity unit to a full shop fit-out. Our size also makes us competitive and able to play with the big boys. AE Shopfitters have supplied joinery packages to companies exporting the finished product to places such as East Timor and Fiji. 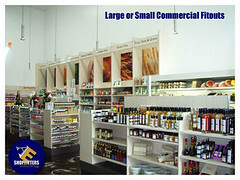 Our business can design, build and create the entire interior of your shop, store or company. We work to your requirements and needs to create an entire new world for your business. We supply joinery packages to companies such as Cold Rock Ice Creameries, Zone Fresh Markets, Sushi One Stores and many more.We also supply and install new two-pack and granite kitchens and vanities to local builders from renovation and new building projects. 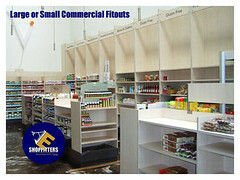 AE Shopfitters is experienced in shopping centre work and are licensed up to 2000 sq mtr fit-outs. We specialise in the catering and food service industries and have completed projects such as bar fit-outs, fruit and vegetable shops, take-aways, ice cream shops, food courts and many more including clothing stores and sunglass outlets. We also manufacture toilet partitions, booth seating and shelving systems. Supply only of joinery packages to other companies to suit their fit-outs as required. Supply and install of domestic kitchen and bathroom packages. Complete new site fit outs including plumbing, electrical, flooring, painting and other services. Renovation works and budget face lifts to existing shops.